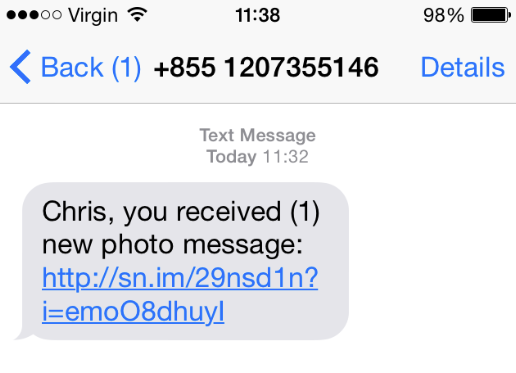 Below is an SMS scam. It’s personalised, which means the person running the scam has a list of names and phone numbers. The idea is that you’re being tricked into clicking the link, which takes you to a website. In some cases the website is a fake store telling you you have $500 credit. It then asks you to download an app. You should never install apps on your phone from random scammers. If you see this SMS delete it. It’s a scam. The sender’s phone number is most probably fake, which isn’t hard to do with SMS messages. The link shown at the end will probably be different each time. The country code shown in this SMS (+855) is from Cambodia.